I have to start by saying, my Mom was so brave :-) the day after mothers day this year, my mom was told she had brain cancer. I was shocked, scared, angry & sad all at the same time. She, Jan, was always so full of life, the life of the party. I could not imagine her having to go through chemo & radiation. I was so scared for her, so scared I couldn't breathe at times. I don't know why but I really never thought of her having to die, I just really assumed she would get to grow old & we would have her for a very long time. My mom lived over 2 hrs away from us (my sister Lori, brother William & myself Louann) so we didn't see her as much as we should or could have. When we found out she was sick she got to come stay here with my sister so we spent the last 3 months of her life spoiling her every chance we had. The doctor said he removed all of the tumor with surgery so that gave us hope that she could beat this for a short while, a couple of years maybe... And I held on to God reaching down and touching her to deliver a miracle. My heart is shattered into tiny pieces. This is not normal to be without your Mom, she was supposed to be here with us. My Mom had such a huge heart that so MANY people called her mom, or grandma that was not even blood related, that was just how she was, full of love, lots of laughter, always smiling, ALWAYS the center of attention in the room :-) I'm trying to figure out how to even think about the holidays without her because she absolutely loved the holidays. I just want to always remember the beautiful smile she had, her laughter, I'm so afraid I will forget that sound. I don't think I ever told her that she was the perfect mom for me, I think she knew that, I pray she knows that, but wished I would have said it, so I'm saying it now. For my Momma, I love you so very much, I'm so proud to say you were my Mom, and so thankful to God for the last 3 months of her life. 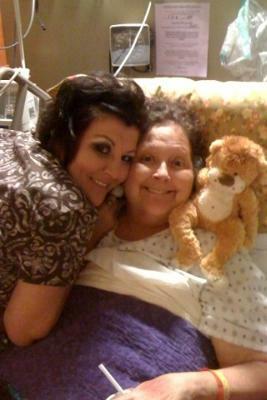 Even though I want her here, I'm so thankful she did not suffer in ways that some cancer patients have to suffer. I miss her more than I knew it was possible to miss someone. Janice Ann (Watkins) Morris, 4/9/49 - 8/14/10. We miss and love you so very much, your kids Lori Griffith, William Yager Jr, and Louann Mckethan, may God hold you close Momma until we meet again. I enjoyed reading about your mom. I too have felt the horrible pain of losing my mom and my dad both of cancer. mom was 44 and dad was 64. She died 17 years ago and dad died july 2010. I am so angry and don't understand why both had to go so young. I know God has his own plan and it is the better one, but it hurts so much. I feel like a little girl longing for her parents. Especially dad right now because we became so close. He was all I had. He is gone and I miss him horribly. I think I am still in denial becauwe I can not look at his pictures yet or hardly talk about it. It makes it too real and I don't want to face it. I don't share my feelings with people cause i think they will think that it was just my dad and I should accept it. I do not want to accept this. I did my mom but just can't accept his passing right now. Don't know why I got on here. Quess I needed to vent alittle. So sorry you have lost your mom and just wanted you to know there are people who know the hurt you feel. God Bless. I loved your mom too and have been missing her so much. I wish I could see her and talk to her again. I will some day. That's the peace in all of this. Knowing Jesus as my personal savior and knowing that she did too, gaurantees we'll see each other again. You will never forget her laugh or the sound of her voice. I never did, even though we were seperated for many years. So odd that you mentioned her laugh. I was thinking about her laugh for the last couple of days! Love to you, and healing too. God will help you during the Hoildays. LouAnne, I'm so glad you have had the opportunity to share your mother's story! I will pray for you and your family every day! Love you! To my sister-in-law with love!!! !